Last model of NZFS 2 person bivvy (as per Bob's Biv). 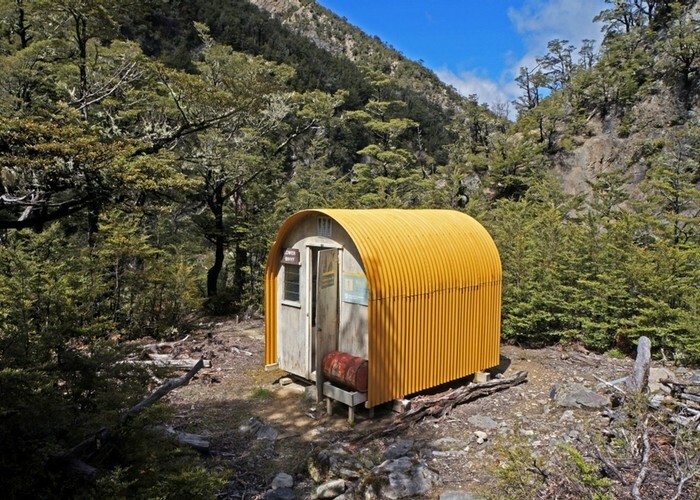 Curved, corrugated iron cladding with internal plywood lining of walls and floor. 2 bunks, cooking bench and bench parallel to bunks. Well insulated. Mattresses removed in 2006 have been replaced in 2009! Situated in bend of Salmon Creek on small, flat open terrace amid beech forest. Campsites around biv, sufficient for 3 tents. Good Fireplace with waratah beside hut for toasting marshmellows and cooking on. Lower Salmon Creek Biv • By Hugh vN. Licence: C.
Added 22 January 2009 by HonoraHonora. 2 revisions, most recently 29 August 2010 by HonoraHonora.